Well, that's a surprise. Variety just announced that not only is Warner Bros going ahead with a Suicide Squad movie, but they announced the cast. The two biggest surprises in the cast are that Jared Leto will be playing the Joker, and Will Smith will play Deadshot. What is Suicide Squad? Suicide Squad will be based on the DC comic series, where a group of imprisoned supervillains are given a chance by the government to carry out high-risk missions in exchange for getting their prison sentences reduced. The catch is that the missions often end up killing members of the squad. In the comics, Deadshot is an assassin with perfect aim who often wields a variety of weapons, including wrist-mounted machine guns. He's known for his brutality and lack of concern for his own life or the lives of others. To hear he's being played by Will Smith is surprising, to put it mildly. Smith's only real foray into comic book lore was as the alcoholic antihero John Hancock in the movie Hancock. Certainly he'll be channeling some of that in Suicide Squad, but this role could put him squarely in the realm of villain if it's faithful to the comic. Smith's known for playing heroes, so this will be a stretch. Also, there's the fact that Deadshot is typically known as white, not black. So this is pretty big, showing Warner Bros is willing to take risks with this movie. We'll report more details as we learn them. But we're excited. 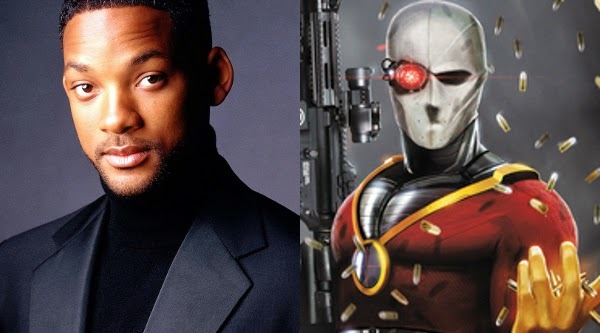 What do you think of Will Smith as Deadshot? Not sure about that choice. And not sure Smith can be ruthless enough to play the role. Winters Tale. Will Smith. That's all you need to know. Well, if Heimdall can be portrayed as a black fella without any issues I don't see the problem with Deadshot either. After all, the movies are interpretations of the comics with numerous changes made to the MCU that were bigger than the colour of a characters skin, and not literal adaptations. As I said, can't see a problem. I guess After Earth really hurt his career. lol I thought if they were going to put him into the DC Universe he would have been a good John Stewart Green Lantern. I'm just not sure why they need the Joker in this movie. I mean he's the ultimate non-team player. I suppose they could do like the recent animated movie where he's not actually part of the team but still involved in the plot.